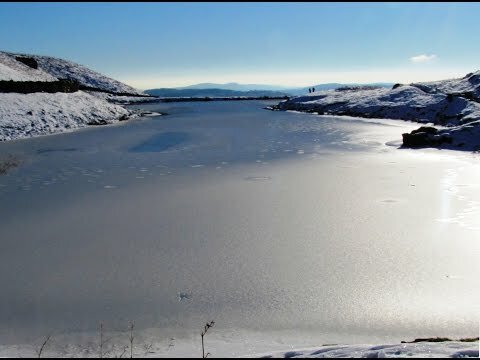 Alcock Tarn situated at 360 metres on the western flakes of Heron Pike was originally a small natural tarn known as Butter Crags Tarn. This stunning tarn was enlarged by means of a stone and earth dam in the 19th century to a depth of about 2 metres and it was then stocked with brown trout by its owner Mr Alcock of Hollins in Grasmere. The walk up to the tarn offers some of the best views of the Grasmere valley and the tarn provides wonderful views of Grasmere and Grasmere Lake to the west, Lake Windermere to the south and Coniston to the south-west. On a clear day Blackpool Tower can be seen in the far distance. Heron Pike at 612 metres rises on the long southern ridge of its parent fell Fairfield and is mostly climbed as part of the Fairfield horseshoe walk. It sits between the adjoining fells of Nab Scar and Great Rigg. The fells eastern side, featuring Erne Crag and Blind Cove, falls away steeply towards Rydal Beck and its western side featuring Alcock Tarn falls towards Grasmere. Heron Pike has a secondary top, named Heron Pike North Top, about 400 metres north of the main summit. The North Top bears the remains of a cross wall some of which has been used to form a small cairn whilst the main summit has flashes of Quartz in the uppermost rock and has superb views of Windermere and the Coniston and Central Fells. We turn left out of the car park to the main road and take the lane opposite to pass by Dove Cottage. We head forwards uphill for ¼ mile to How Top Farm on our right opposite a pond. We turn left at the signpost no through road for motors and path to Rydal and head steeply uphill for a short way. We turn left onto a stony track signposted Alcock Tarn. At the National Trust sign Brackenfell we go through the gate and follow the track through the trees to go through a second gate. At a junction of paths we bear right and follow the stony track passing through a gate as it winds steeply uphill to the high pinnacle of Grey Crag. We bear left skirting round Grey Crag and soon start to level out. We continue forward through a gap in the stone wall and follow the grassy path to Alcock Tarn. With the tarn on our right we follow the path to go through a metal gate at the far end of the tarn. We now continue forwards following the path which soon descends steeply to the far corner of some trees. We then turn left still downhill to Greenhead Gill. We cross the gill at a safe place because the floods have washed away the wooden bridge then turn left downhill to go through a gate. We head forwards following the tarmac track to a lane we now turn left and follow the lane to meet the main road next to the Swan Hotel. We cross over the main road and take the lane opposite. We follow the lane which bears left into Grasmere village and then make our way back to the car park. This is moderate walk with a steep climb to the tarn on good stony and grass paths and tracks. There is also some quiet tarmac lanes and the main road, A591, to cross. Elevation: Approx lowest point 65.6m (215.2ft) approx highest point 370m (1214.2ft) approx ascent 325.5m (1068ft). Approx 3.3 miles allow 2 – 2½ hours using OS Explorer Map OL7, The English Lakes South-eastern area. This walk is anti-clockwise. Start point: Main car park on the right just off the A591. Grasmere is located just off the A591 north of Windermere and Ambleside in the Lake District, Cumbria. From the A66 at Threlkeld take the B5322 on the left. At the t-junction at Legburthwaite turn left onto the A591 which runs by the side of Thirlmere Lake. At the roundabout turn right into Grasmere. The main pay and display car park is just on the right. The free parking lay-by is on the left before the roundabout. Parking: There are three Pay and Display car parks, £8 for all day, in Grasmere and very limited free road side parking. There are two free lay-by car parks on the main A591.